​Norcote International, Inc. is a world-class manufacturer of UV curable screen printing inks and coatings. Our products are used for flat-screen and rotary-screen printing on many types of plastics, metals, and other substrates compatible with the UV curing process. Typical applications are plastic sheets, loose-leaf binders, bottles & containers, CD/DVD disks, rotary-screen printed labels, membrane switch overlays and nameplates. We also carry ancillary products to provide our customers with a complete package from Norcote. Norcote has spent over 40 years focusing our development on UV curable printing inks. We make every effort to develop innovative, market-driven products allowing our customers to be leaders in their respective markets. As your markets evolve, we want to develop our products with a focus on you and your needs. We are ready to change with you. Whether you are new to UV printing or are a seasoned veteran, we stand by you to ensure your job is done right. We can provide you with the right tools to use our products and help you every step of the way. From laboratory testing to on-site troubleshooting, our Technical Service Representatives can help get your next project completed successfully. We realize that our standard colors do not match every color you need. We have a team of color experts that will work with you to match a specific color with a turn-around time of one to three days. Our Color Specialists can train your staff on-site in the use of our products and have access to the latest technology in color measurement and analysis. Our friendly Customer Service Representatives can make sure that your order is handled efficiently and promptly to ensure your orders are delivered as expected. 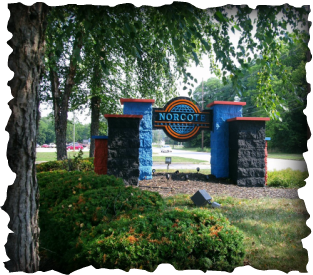 Norcote International, Inc. began as a one-man company in 1976 in the basement of a suburban home in Chicago. Norcote´s manufacturing facility is located in the U.S.A. with other facilities in the United Kingdom, Singapore, China and Mexico with distribution in numerous countries across the globe. Norcote was first to supply the plastics industry with a viable UV Curable Screenprinting Ink in the early 1980´s. Since then, we have followed our customers to nearly every corner of the earth. Founded in Technology, Norcote remains an innovator in UV Curable Screenprinting ink solutions. Our dedicated employees come to work each day with a focus on our customers. Norcote employees pride themselves in going the extra mile to meet your needs. Our competent staff is happy to assist you in any way possible. First in UV ink technology, Norcote has stayed true to our roots by not diverging from this path. Our innovative technologies ranging from inks for In-Mold Decorating to proprietary process ink rheology have served as testaments for our ambition to remain a leader in UV ink development. We strive to develop products which allow our customer to lead their markets into the future and try to solve tomorrow´s problems today. Our technical staff comes from a diverse experience base. We look at problems through the eyes of the printer. We are known for our expertise and application knowledge of the markets we serve. We offer a wide range of services including custom color formulation, color management, application troubleshooting, as well as lean manufacturing principles. We can help you meet demands and improve your production efficiency. Norcote has representation on every continent around the globe. We have an extensive distribution network allowing us to provide products and services to your locations. Our international presence fosters a globally-centered culture within Norcote to develop quality products and services for the world. Norcote was the first North American UV Screen ink manufacturer to be registered to the ISO9001 standard in 1996. Norcote is focused on providing high quality Ultraviolet inks and coatings together with superior services and support through meeting and exceeding customer requirements, company-wide dedication to the continual improvement of its Quality Management System, and compliance with applicable laws and regulations.